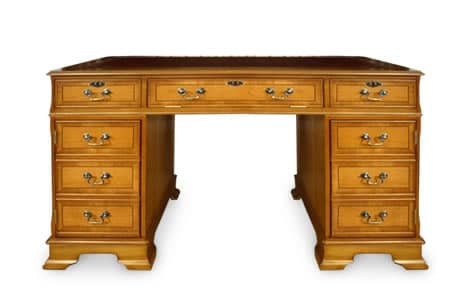 The Cromwell pedestal desk range is a recent addition to our very popular reproduction office furniture. 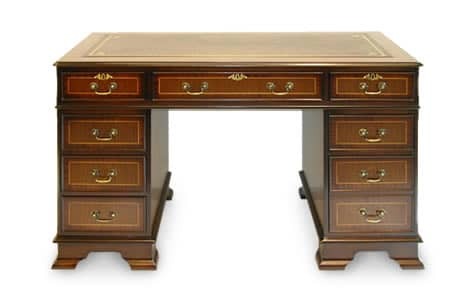 Made to the same high standard but incorporating slight design changes over the Regency pedestal desk to give it a more detailed and stylish look. All the drawers come with white line and contrasting veneer finish on the Mahogany and black line detail on the Yew finish. All pieces have bevelled pedestal edges and come finished on a stylishly moulded corner leg. All desks are 762mm high. There are 2 wood options to choose from.